Know everybody, help your neighbor…if we have a need, we don’t wait for other people to take care of it. [We are] very self-sufficient…very much family-oriented. Surrounded by mountains and forestland, Potter County, Pennsylvania, is described in tourism materials as “God’s Country.” This rural community with an estimated population of just over 17,000 is tucked into the northern Appalachian Mountains. Of the county’s 692,000-plus acres, more than 60 percent is either owned by the state and maintained as state parks, forestland, or game lands, or protected under the state’s farm and forest preservation program. Three major watersheds meet in Potter County: those of the Chesapeake Bay, the St. Lawrence River, and the Mississippi River. In addition, the headwaters of the Allegheny River have their source in the county. Outdoor activities such as hiking, biking, camping, hunting, and fishing are popular here, enjoyed by residents and tourists alike. Although tourism and farming are big business, Potter County’s economy is more diverse than that of many other counties highlighted in this report and includes telecommunications, health care, education, construction, and government. These better-than-expected results are likely influenced by local conditions and initiatives that improve overall well-being. For example, field research suggests that committed local health care providers and strong regional and local collaboration have played a major role in the county’s health. In Potter County, a community culture of volunteering and involvement may also contribute to a health-promoting sense of social cohesion. Potter County’s classification as a Bright Spot means that, on average, the county performed better than expected on a number of health outcome measures, given its characteristics and resources—that is, the socioeconomics, demographics, behaviors, health care facilities, and other factors that influence health outcomes. It does not mean that all residents here enjoy excellent health. In fact, the county still lags behind the rest of the nation on many health indicators. Like other counties with limited resources, Bright Spot counties face challenges to attaining good health outcomes. Potter County’s performance, however, indicates that certain county conditions or programs may be helping generate better-than-expected outcomes—and that other resource-challenged Appalachian counties may benefit from adopting similar initiatives. Potter County represents a nonmetropolitan county in Northern Appalachia. It is one of two Bright Spot counties in Appalachian Pennsylvania. Located in north-central Pennsylvania, Potter is one of the state’s less populous counties (63rd in population out of 67 counties). Eighty-three percent of Potter County’s 17,451 residents live in five small towns. Coudersport, with a population of 2,546, is the county seat. One state road links Coudersport to Williamsport, which is about 90 miles to the southeast. The population is racially homogeneous, approximately 98 percent white. Nearly half (48.8 percent) of adults have at least some college education, compared with 63.3 percent nationally. The median 2014 household income was $40,323, significantly lower than the national median of $56,135. Unemployment in 2014 was 7.4 percent, compared with 6.5 percent regionally and 6.2 percent nationally. Just over 14 percent of residents live in poverty, compared with 15.6 percent nationally. 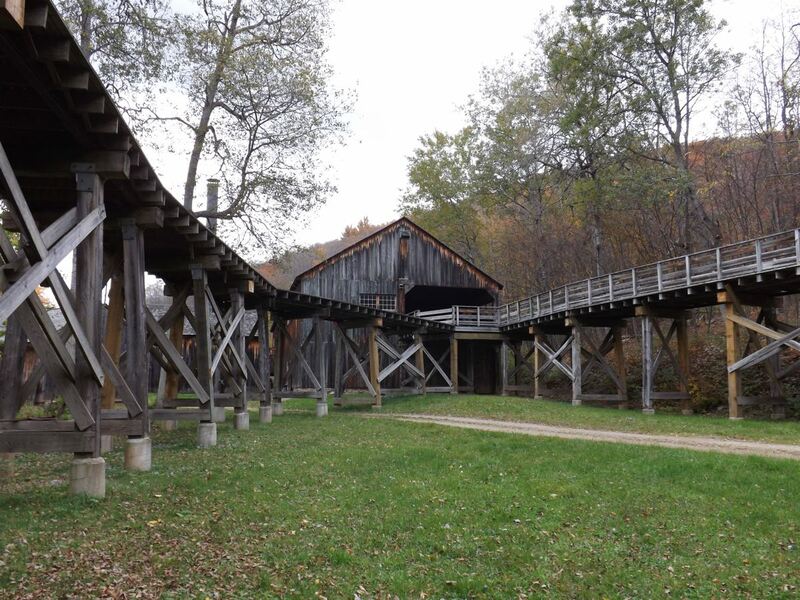 The Pennsylvania Lumber Museum, in Ulysses, is one of Potter County’s tourist attractions. Photo by Amanda Jones. Revenue is a challenge in Potter County because the state owns so much of the land. In lieu of property taxes, the county receives payment from the state on those lands, which until recently was only $3.60 per acre, and that revenue has to be divided among the county, the municipalities, and the school district. As of 2017, the state will pay the county $6.00 per acre—a 67 percent increase in revenue on those lands (Swift 2016). Cole Memorial Hospital in Coudersport is the hub of health care and wellness for a six-county rural region and is a magnet that draws resources from larger health care centers in Pennsylvania and New York. Through Cole Memorial’s extensive network, most Potter County residents can readily access primary and specialty care services, first-response emergency care, and fitness opportunities. 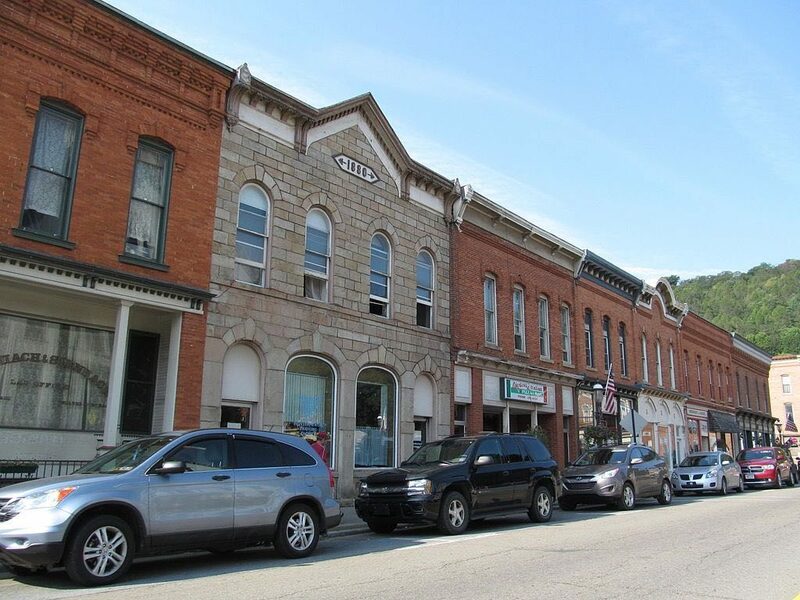 Like the residents of other Bright Spot communities explored in this report, people in Potter County have worked to elevate physical, social, and economic health in several ways. There’s a strong sense of health as a shared resource here, and a sense that everyone in the community plays a role in promoting it—whether through volunteering, looking out for one’s neighbors, or working to protect the environment. Community-oriented health services: Cole Memorial Hospital is a nonprofit critical access hospital that has been part of the community for over a century; its extensive network of health clinics and wellness centers offers routine as well as specialty services. The hospital incorporates community participation and feedback to provide efficiently tailored services. Strategic collaboration: A regional partnership strategically pools resources to improve health outcomes for people at risk; local collaboration is facilitated by the location of all social services in one building. Resident involvement: Volunteering is part of the community culture, and residents consider themselves active stewards of their environment. Employer support for health and wellness: Local employers provide good health benefits and encourage participation in wellness programs. Like other Bright Spot communities, Potter County has programs in place that fall into several overarching categories: leadership, cross-sector collaboration and resource sharing, and local providers committed to public health. It is difficult to overstate the importance of Cole Memorial Hospital‘s leadership to Potter County. It is the anchor institution here, with roots dating back to 1917, when it opened as Coudersport Hospital. In 2007, Cole Memorial was designated a critical access hospital, and today it operates as a charitable nonprofit health care organization serving 55,000 residents in an area that includes Pennsylvania’s Potter, Cameron, McKean, and Tioga Counties. According to its 2017 annual report, Cole Memorial had 65,300 outpatient visits; 23,650 home health visits; 9,000 emergency visits; and 4,000 express care visits that year. It logged 6,300 inpatient days; performed 5,600 surgeries; and delivered 200 babies. Cole Memorial is also a major employer, with 824 employees, 610 of whom are full-time. 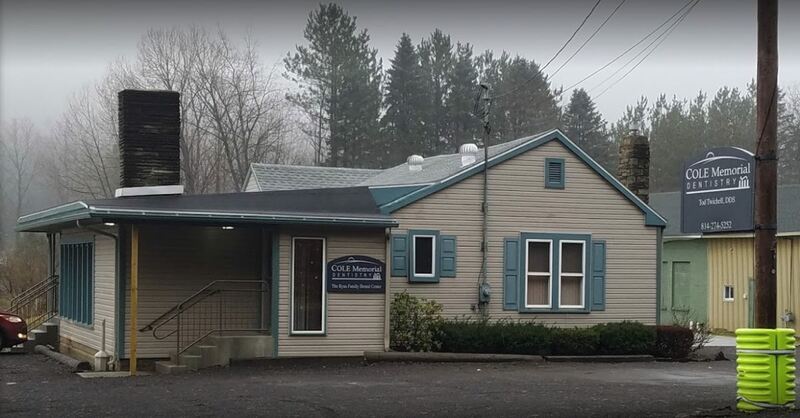 In addition to the hospital in Coudersport, Cole operates a network of 10 health clinics that serve residents in north-central Pennsylvania and south-central New York. Satellite clinics opened in the towns of Emporium, Ulysses, and Shinglehouse in 1979; additional offices opened in the towns of Eldred, Smethport, Westfield, and adjoining counties in the 1990s. The Cole system also includes specialty units that provide home and hospice care, psychiatric care for seniors, skilled nursing and rehabilitation, emergency medicine, cardiac rehabilitation, and radiation oncology. Other specialty practices include cardiology, otolaryngology, orthopedics, pain management, general surgery, podiatry, telepsychiatry, tele-rheumatology, and gastroenterology. Viewed as a homegrown, nonprofit institution, Cole Memorial is an organization that most residents feel comfortable getting care from. The location of satellite clinics in the area’s small towns further enhances access to care. The hospital’s sponsorship of health fairs and senior expos, its offerings of subsidized health screenings and involvement with workplace wellness services, and its new initiative to help patients better navigate the health care system all reinforce its image as a critical community pillar. The county also offers veterans’ health care: several years ago county officials succeeded in bringing a branch of the Bath (New York) VA Medical Center to Coudersport. Prior to the clinic’s opening, veterans had to drive nearly two hours each way to get to their medical appointments. Now, they can get care in the community. Employers also play an influential role in supporting community health. Potter County has more than 50 sizeable employers, and nine of the ten largest employers offer health insurance benefits. Six of the top 50 employers are school districts, government agencies, or employers associated with the Cole health care system. All of these employers offer health benefits. Cole Memorial Hospital also offers its employees an extensive wellness program, one that constitutes a model for other employers in the region. Commitment to health is also evident in the Potter County public school system. Public schools contract with Dickinson Center, Inc., a nonprofit provider of rural behavioral health care, for acute crisis services when students are in distress. The schools also collaborate with Cole Memorial to offer health and dental screenings to students. Project Rapport offers special education for pregnant and parenting teens. The Too Good for Drugs program educates students about the dangers of drug use. A program called A Way Out deals with domestic violence and sexual abuse and promotes healthy relationships. Another program, Parents Helping Parents, provides support for parents struggling to cope with their children’s behavior. The schools have also worked with the Potter County Suicide Prevention Task Force to bring in the national Rachel’s Challenge program, which works to reduce harassment, bullying, and violence in schools. 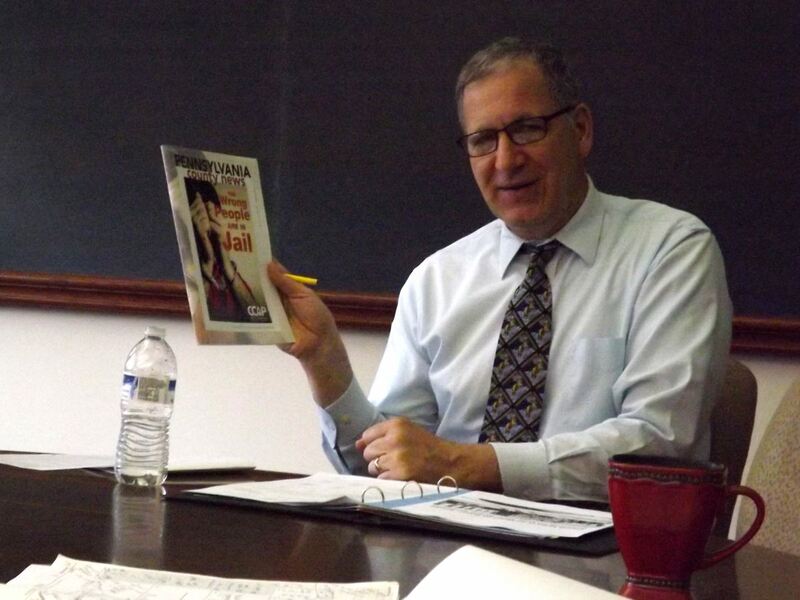 In addition, criminal justice leaders recognize the links between public safety, health, and quality of life. A pre-trial diversion program offers treatment to offenders with mental health or substance abuse issues, instead of putting them in jail. The county has developed specialty courts, and discussions are in the works to develop similar court programs handling veterans and those with mental health issues. Through these programs, recidivism has dropped, saving the county money and helping people get their lives on track. In-jail programs and a residential recovery center help people address issues that are keeping them from leading productive lives. The CLEAN protocol—Concerned Law Enforcement Against Narcotics—gives drug users an opportunity to seek treatment without being criminally charged. Transportation is an issue for many defendants involved in drug courts who need to get to appointments in different parts of the county. When a judge floated the idea of providing bicycles, the county drug and alcohol services division secured a grant to purchase 15 bikes for defendants to use. Cole Memorial Hospital is a key agent in orchestrating local cooperation and regional collaboration. The hospital has long served as a link between patients and specialty care providers in the region and throughout the state. In recent years, the hospital has formed collaborative relationships with the Guthrie Clinic in Sayre, Pennsylvania, to provide care in otolaryngology; with Geisinger Health in Danville, Pennsylvania, to provide psychiatric care, and with the University of Pittsburgh Medical Center Hamot to provide heart and vascular care. More than 20 years ago, the hospital joined with Lock Haven University of Pennsylvania to create a training program for physician assistants seeking to work in medically underserved parts of the state. In this way, Cole has connected its patients and its primary care staff to the medical resources of a much wider area. Cole Memorial Dentistry in Coudersport. Photo by Amanda Jones. Locally, the hospital has facilitated cooperation through its Community Health Council and Community Benefit Advisor program. A more recent regional initiative, the Northern Tier Community Health Collaborative, pools resources and coordinates physical, behavioral health, and drug and alcohol services for vulnerable populations in rural areas. A strategic focus for the collaborative is promoting “health literacy” to help patients understand their basic health needs and how to get those needs met. Another example of cooperation in Potter County is the consolidation of human services under one roof, similar to what officials in Tioga County, New York, did. This hub arrangement facilitates information sharing, networking, and coordination—and makes it easier for residents to get needed services. There is a strong sense of small-town connectedness throughout Potter County. People here feel responsible for each other and help their neighbors when they are in need. In this way, they share important personal resources—time, energy, expertise, and goodwill—that advance community health. Volunteerism is part of life here. Volunteers coach youth sports and work at the Potter County Fair, the God’s Country Marathon, and the Austin Dam Memorial Park. They monitor water quality, protect animals, and mark hiking trails. People here are also particularly mindful of the needs of elderly community members. Senior centers in Potter County are not just for socializing—they offer classes on medication management, how to avoid scams, and how to deal with wildlife encounters; organize bus trips and walking groups; assist with Meals on Wheels; complete community service projects; and provide a social support safety net for area seniors. Meals on Wheels is an important program, providing food and wellness checks for seniors, some of whom are shut-ins living in remote areas. During a particularly tough winter when many back roads were impassable by car, volunteers drove snowmobiles to deliver meals to needy seniors. Residents view themselves as stewards of their environment. They are particularly proud—and protective—of their water resources. Several groups have formed to monitor these resources—public, private, and surface. People also band together to protect other important community assets. In Coudersport, residents raised hundreds of thousands of dollars to save the community pool, the county’s only public swimming facility. When the borough council considered a proposal to sell part of Coudersport’s arboretum, a source of history and pride to the community, 850 Coudersport residents signed a petition opposing the move. Their impassioned pleas during a council meeting on the proposal helped stop the sale. Recently, a well-loved ski resort at Denton Hill State Park, the only one of its type in the region, was closed. Community members immediately joined forces to create the “Save Ski Denton” movement, which gained traction online and eventually caught the attention of state lawmakers. The state is now working to turn the park into a year-round destination. Cole Memorial has demonstrated remarkable support for community health—in some cases, magnifying the effects of health-promoting activities in other sectors. For example, employer support for health is bolstered by the hospital’s Center for Workplace Wellness, which provides preventive health care and screenings to local industries and organizations. As an outgrowth of its 2016 Community Health Needs Assessment, Cole is developing a multi-year workplace wellness program to help employers improve the health of their employees. Four more local employers have recently committed to becoming wellness partners next year. Here, again, Cole Memorial is playing a major role in bringing health care services to the Potter County community. The hospital also operates four wellness centers in the region, including one in Coudersport. Open 24 hours every day, these centers offer exercise and strength-training equipment, locker rooms, steam rooms, whirlpools, and outdoor walking trails, as well as exercise and other health-related classes. In addition, the region hosts other privately operated fitness facilities, and public school gyms are open to residents. No other Bright Spot county offered this range of exercise and wellness resources. Cole Memorial’s community orientation is evident in other ways. One of the governing board’s four subcommittees, the Community Health Council, guides the hospital’s efforts to improve public health in its service region. The health council also maintains an associated Community Benefit Advisor program that brings together approximately 100 representatives from local institutions and community groups to discuss emerging health issues and how the hospital can best respond. This group meets four times a year and recently helped Cole conduct a community health needs assessment. The hospital is also active with the county’s four senior centers and has organized a dental health collaborative. In addition, the hospital teams up with local civic organizations (e.g., Rotary clubs) and libraries to host five comprehensive blood analysis events every year, serving more than 800 community residents. These events are held on Saturdays at various locations in the county. Cole Memorial also provides free mammograms and cancer screenings every month. Low-cost comprehensive blood panel workups are also available at screening events. The hospital’s ob-gyn and cardiac rehabilitation services may play a role in lowering rates of infant mortality and heart disease mortality. Health fairs, where residents can get free or low-cost screenings for high blood pressure and cholesterol, may help lower heart disease and stroke mortality. Health benefit plans that cover prenatal care may also contribute to lowering infant mortality and low-birth-weight births. Psychological barriers to care-seeking may be lowered because Cole is a locally rooted institution with a local identity. Strong leadership and collaboration have helped Potter County overcome many of the health challenges faced by resource-strained rural areas that lack public transportation. Over the years, Cole Memorial Hospital has developed an extensive service network—including outpatient clinics, specialty services, wellness centers, and screening programs—that is the backbone for health care in the county. Community participation and feedback play an important role in shaping the hospital’s approach to serving the population, including the services and programs it offers. Strategic collaboration has also strengthened regional and local capacity for meeting health needs in Potter County. Cole Memorial has forged partnerships with other providers, such as the Guthrie Clinic, Geisinger Health, and University of Pittsburgh Medical Center Hamot, to provide services that residents need. And a more recent regional initiative, the Northern Tier Community Health Collaborative, pools resources and coordinates health services for people living in rural areas. With limited government funding, community members have nurtured a culture of volunteerism and activism that helps to fill gaps in services and preserve shared resources. They contribute to protecting the health of vulnerable populations, such as the elderly, and to safeguarding health-supporting community assets. Finally, many local employers recognize the importance of community health. They offer good health benefits and encourage employees to participate in wellness programs. Together, these factors help keep Potter County a health-promoting community while ensuring the welfare of its residents. Chandra, Anita, Joie Acosta, Katherine Carman, Tamara Dubowitz, Laura Leviton, Laurie Martin, Carolyn Miller, et al. 2016. Building a National Culture of Health. Cole Memorial. 2017. “2017 Annual Summary.” Accessed May 15, 2018. Institute of Medicine (U.S.) Committee. 1990. Medicare: A Strategy for Quality Assurance. Edited by KN Lohr. Vol. 1. Washington (D.C.): National Academies Press (U.S.). Office of Disease Prevention and Health Promotion. U.S. DHHS. 2017. Healthy People / 2020 Topics & Objectives/ Access to Health Services. Accessed July 27, 2017. Potter County Planning Department. 2000. “Potter County Comprehensive Plan – Preserving and Enhancing the Quality of Life for Current and Future Residents of Potter County.” 2017. Welcome to Potter County. Swift, Robert. 2016. “Payments for state-owned forests, parks increasing.” The Times Tribune, December 18, 2016. World Health Organization. 2017. The determinants of health. See Table 30 in the data appendix at the end of this case study for a full list of actual health outcomes for Potter County compared with predicted outcomes. For details on the outcome measures, see the data files accompanying the report Identifying Bright Spots in Appalachian Health: Statistical Analysis. Table 28 in the Potter County data appendix at the end of this case study provides a quantitative profile of county characteristics. For a full explanation of the methodology, see Appendix B: Research Approach. For a list of key informants interviewed for this county, see Table 29 in the data appendix at the end of this case study.